Zytiga Tablets distributors, dealers & suppliers in Mumbai. Pacliall:- Human serum albumin is the most abundant protein in human blood plasma. It is produced in the liver. 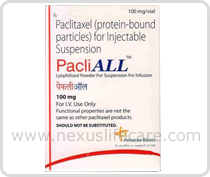 Uses:- Paclitaxel Injection is a mitotic inhibitor used in cancer chemotherapy. Paclitaxel Injection is now used to treat patients with lung, ovarian, breast cancer, head and neck cancer, and advanced forms of Kaposi's sarcoma. Paclitaxel Injection is also used for the prevention of restenosis.